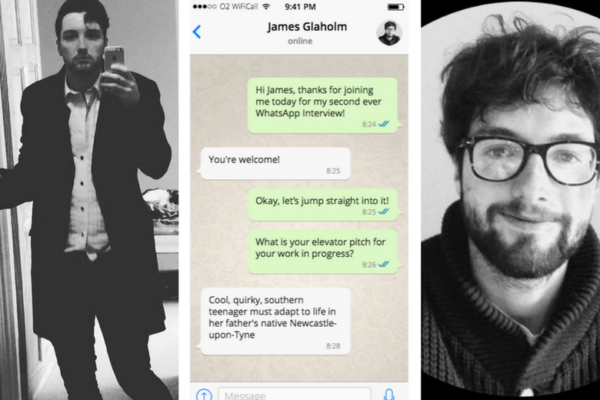 The WhatsApp Interviews are a series of chats between me and other writers. We talk about reading and writing habits and preferences and throw in a few quickfire questions. All on WhatsApp! This week I am interviewing James Glaholm, a writer from Newcastle who has completed his first novel and is currently working on a mysterious second project. What is your elevator pitch for your first novel? James: Cool, quirky, southern teenager must adapt to life in her father’s native Newcastle-upon-Tyne, where some people are enticed by her and others are rather jealous. Have you ever thought about which actors would play your main characters if your book was made into a movie/tv show? a. There aren’t many Geordie actors. b. A lot of the characters look like people I know, it’s hard to imagine any actors in it. Perhaps Shane Ritchie as Uncle Isaac, maybe the guy who plays Combo in This is England as Roger – I reckon he’d do a good Geordie accent! But a lot of my characters are quite young, so anyone acting as my characters would have to be fairly unknown just because of their age! But I always picture it as a bit of an indie film anyway! James Glaholm: Normally just random, sometimes I will have a character in my head I want to write about, but other times, when a protagonist encounters another character, I just think one at random and usually end up sticking with it. I think names that make for good nicknames are helpful too. I know our protagonists have the same name! Sorry about that! James Glaholm: Usually energise, I always try to end at a point where I’m excited to write what happens next, so I’m eager to go back to it. But I try to write things I’d like to read so usually I enjoy it. I think that is why my descriptions of places aren’t the best. James Glahom: I think to have a collection of books where each is different, very different from the others. I’d like to be known as a feminist writer. And a kind of ‘champion of domesticity’. I also think representing the north would be a big one for me. What kind of research do you do, and do you do it before starting a novel? James Glaholm: I don’t usually do research, I write what I know. But little things I research. One thing that irritates me is I never know about architecture. You know how Tessa Hadley will say like ‘Georgian houses’ and stuff? I’m like, how do you know that?! Do you have any unfinished books or stories sitting on your computer? James Glaholm: Yes. One that I am working on and a few lost causes. Ooh, can I ask what you are working on or is it a secret? James Glaholm: I’m calling it a ‘project’ because I’m not ready to commit to another novel. But the idea is something that happens over one night and most of it is the past but the start and end take place on one night. Do you subscribe to any magazines or journals? I don’t actually, I did buy the Writers & Artists Yearbook, I think you are the reason I got it. James Glaholm: Ermm. At the moment it’s as and when. In the last few weeks I’ve moved and started a new job, but as things calm down I hope to get more of a routine. Okay, we are going to move on to some reading questions. What is the first book that made you cry? I have never cried at a book, but two that came close is a Tim O’Brien extract where a soldier in Vietnam kills a buffalo (I think it’s a buffalo) by shooting pieces of its body away slowly. And in Perks of Being a Wallflower where the teacher asks him whether he knows how great he is. Great scene. Are there any authors or books you disliked at first but grew into? James Glaholm: Wuthering Heights, that starts quite slowly. The Left Hand of Darkness. American psycho. It’s usually old books. I read a book called The Bricks that Built the Houses over summer and I think that deserves to be massive. I guess certain books make you wonder why books, in general, aren’t as famous as they should be. James Glaholm: What is your favourite childhood book? James Glaholm: I didn’t read much as a child so it’d have to be a Harry Potter. I read Submarine when I was 17/18 and that kind of opened my eyes to how books could be. It’s set in Wales and is brilliant! What is the best piece of writing advice you have ever been given? James Glaholm: It wasn’t given directly to me but I remember Fay Weldon saying ‘it’s not about being something, it’s about doing something’. And in The Curious Incident of the Dog in the Nighttime, there is the bit where he’s told to write the kind of thing he’d like to read. Which I might have mentioned earlier. I also think the classic ‘show, don’t tell’ has merit. Okay, final question before we go into the quickfire round. So the first WhatsApp interview was with Jehan Nizar, and she gave me the following question to ask you. If you had to pick one person off the course who is to be the Muse for your next novel, who would it be and why? James Glaholm: There are so many inspirational people. Maybe Jehan herself for coming up with such a good question. And I think she’d make for excellent dialogue. And drama! But I think everyone was inspirational in their own way. Quickfire! Don’t think, just answer! Tea or Coffee? James Glaholm: Standalone. Every time. Unless its Gerard Woodward. If you could time-travel, would you go to the Past or Future? James Glaholm: Introvert. Except on the page. Finally: Can you give me a question for me to ask the next WhatsApp interviewee? James Glaholm: Yeah sure. I’ll go with, ‘Tell me about the first time you realised to wanted to write something, not to write in general but about a specific thing that captured you’. Ooh, what a fantastic question! Thank you so much for joining me for the Whatsapp interviews today James! You have been absolutely fantastic! James Glaholm: Thank you. You are very welcome! It’s been fun. If you would like to keep up with everything James is doing and writing, follow him on Twitter or Instagram. a year of writing (and living) dangerously.